This site gives access to numerous online bookshops around the world that sell travel books. There are also links to second-hand bookshops and to publishers. Accommodation and transport around the globe. And lots more interesting things! Illustrated encyclopaedia articles on Scotland. At present there are over 200 articles about Glasgow, the country`s biggest city. The articles are based on the guidebook The Glasgow Guide. Illustrated travel articles about various countries, including France, Iceland, Scotland and the USA. These include travel guides to Iceland and Scotland. Welcome to this specialist Scottish bookshop. This website is being phased out in favour of a new website The Globe Travel Bookshop which will provide links to many online bookshops around the world. You are most welcome to browse around The Scotland Bookshop and look at the entries for many fascinating books; however, we recommend going onto the new website to look for the books that interest you. Many thanks go to all our past customers. See you at the new site ! The Scotland Bookshop includes just about everything to do with Scotland: guidebooks, history, geography, natural history, politics, education, architecture, culture, the arts, literature, places to visit, transport, farming, economics, sports, food, drink, tracing ancestors... and lots more. Only non-fiction books are included. Go to the Help page to find out more about how the bookshop is arranged. Links to secondhand booksellers specialising in books about Scotland. 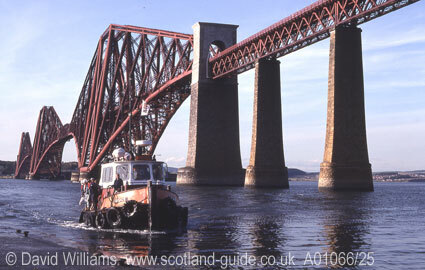 The Forth Railway Bridge spans the Firth of Forth at Queensferry, north-west of Edinburgh, Scotland`s capital. This magnificent bridge was built by William Arrol to carry a railway line high over the Forth. It took seven years to build and was finished in 1890. It is recognised as a world-class engineering achievement and it is one of the great symbols of Scotland.